Colombia has suffered over five decades of an internal armed conflict that has claimed the lives, homes, and livelihoods of hundreds of thousands of its citizens— particularly in the rural countryside. The Colombian conflict is especially complex due to its protracted duration, multiplicity of actors, serious violations of human rights and humanitarian law, and the effect of the drug trade in criminalizing the civil strife.39 The dynamics, actors, and scale of the conflict have changed throughout the years. In 2010, Juan Manuel Santos, Uribe's former defense minister, was elected president and adopted a new approach to the conflict. For the first time, the state acknowledged an "internal armed conflict" and applied the discourse of human rights and international humanitarian law.58 In June 2011, Santos passed the Victims and Land Restitution Law, establishing a massive reparations program for over five million internally displaced Colombians.59 In July 2012, his administration passed a constitutional reform dubbed the Legal Framework for Peace, which wrote exceptional transitional justice instruments into the Colombian Constitution. The ongoing peace process with the FARC was formally inaugurated only a few months later. Fifty years of conflict led to the death of more than 200,000 Colombians, most of them civilians. Each party to the conflict has perpetrated crimes against humanity, human rights abuses, and violations of international humanitarian law. Kidnappings, torture, sexual and gender-based violence, enforced disappearances, child-soldier recruitment, extrajudicial killings, and large-scale massacres have been used strategically and wantonly throughout the conflict.60 Roughly 12 percent of Colombians are victims of displacement, the second-largest percentage in the world.61 Further, the conflict has disproportionally affected Colombia's most marginalized groups: indigenous peoples, Afro-Colombians, and impoverished rural communities. Crucially, the JPL as it was passed in 2005 incorporated language regarding victims' rights to truth, justice, and reparations—a starting point that helped victims gain a central role in all future transitional justice and peacemaking discussions. Colombia's own Constitutional Court determined that paramilitary assets should be expropriated to fund the material reparations owed to victims. The Court also ensured that the authorities administering the JPL were subject to investigation so that prosecutors and victims could corroborate the narratives of the law's applicants. Finally, the JPL replaced the lenient "alternative" punishments it had originally envisioned with reduced prison sentences, lasting five to eight years. Further, the JPL did not condition leniency for ex-combatants on the effective restitution of their victims, despite speaking of a "general duty to repair. "72 The JPL only obligated its applicants to relinquish illicitly-gained assets to the state, and paramilitaries could easily hide these assets via third parties.73 Consequently, Colombia's victims' reparation fund was dwarfed by the estimated reparations owed to victims of the AUC. The success of combined transitional justice and peacemaking efforts depends on the success of both enterprises; the failure of one inevitably compromises the other. As a transitional justice tool, the JPL falls somewhere between an inadequate attempt to do justice and a blatant desecration of the justice itself. Additionally, the outcome of the JPL's peacemaking goals is problematic at best: while the AUC umbrella organization was dissolved, the structures of power and control it exerted did not disappear. The armed groups that arose after the official demobilization of the AUC maintain similar influences, especially over local politics.74 While so-called neo-paramilitaries like the post-AUC bacrim have not tried to remobilize officially, their camouflaged political influence, lasting illegal economies, and continuing violence highlight the shortcomings of the JPL when it comes to making peace. Finally, a conflicted democracy such as Colombia may need not only "moral restoration"75 but also truly transformative reforms that address the roots of the conflict, empower disenfranchised groups, and dismantle structures of economic and political oppression. This need is especially strong with accountability and demobilization schemes designed for state-friendly actors such as paramilitaries. 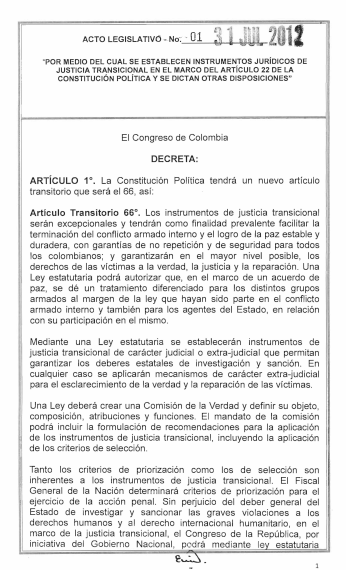 Indeed, failure to discriminate between the transitional justice instruments required for anti-state actors and pro-system actors such as the Colombian paramilitaries can explain many of the JPL's shortcomings.76 Disarming an anti-state actor constitutes a near total renunciation of power, but a state-friendly paramilitary group can relinquish its arms while retaining its power.77 A successful transitional justice scheme must uphold non-repetition guarantees by preventing the perpetrators of crimes from maintaining the victim-victimizer power dynamic. With state-friendly actors, there must be conscientious institutional reform and vetting—initiatives that were, of course, unappealing to many of the powerful state actors behind the JPL. The JPL, which relied on a slow and weakened judiciary to vindicate victims, proved ineffective in its application. 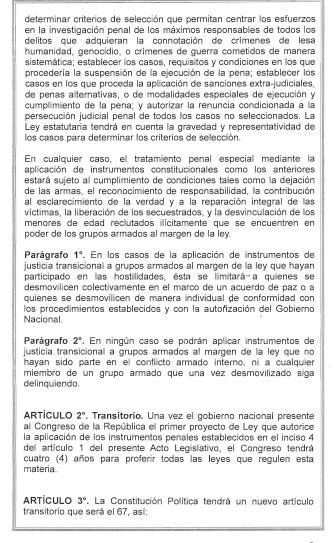 According to the official Informe de Gestión published by the public prosecutor's office, only fourteen out of the 4,800 eligible ex-combatants that applied for consideration under the JPL had received final sentences as of 2013.78 The JPL experience was a lesson in the perils of overburdening a judiciary in the midst of conflict. In the context of the theoretical framework discussed above, the JPL's conception of transitional justice was too reliant on judiciary proceedings. It was neither holistic nor flexible enough to deliver on its justice and conflict resolution ambitions in the midst of ongoing conflict. To remedy the situation, the Santos administration passed legislation in 2012 to redirect prosecutorial efforts to those "most responsible" for a set of serious and "representative" crimes. The verdicts obtained would then be applied to the ex-combatants in the JPL system subordinate to those "most responsible. "79 This reform still focuses on individual accountability, but takes a pragmatic stance to what transitional justice can do in an ongoing conflict. It arguably also recognizes that a transition may require justice to act swiftly, even by selecting some cases for their symbolic impact. The VL is the first well-known transitional justice instrument in Colombia that revolves entirely around victims' rights to reparations. It also represents a radical departure from previous legislation by endorsing transitional justice—and victims' rights in particular—as a means to promote peace. In force since 2012, the VL is an ambitious piece of legislation that seeks to provide reparations to victims of crimes that occurred after 1985 and land restitution for events that took place after 1991. Following the soft law adopted by the General Assembly on the right to remedy, the VL uses the language of "integral reparations,"82 consisting of restitution, compensation, satisfaction, and guarantees of non-repetition.83 The instrument also comprises other collective and individual measures seeking to strengthen the social norms eroded by the conflict, including symbolic reparation, the provision of social services, and the preservation of historical memory through oral accounts. The VL crucially acknowledges the existence of an internal armed conflict, which introduces considerations of international humanitarian law and human rights law. 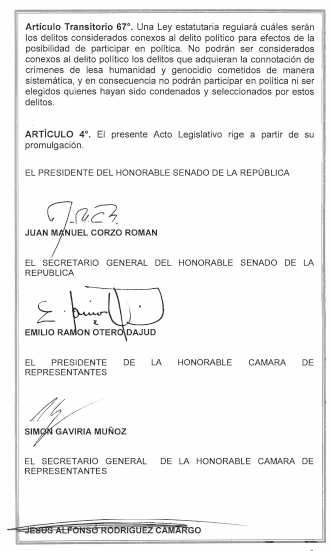 The VL also shifts the responsibility for financial compensation to the state, thus recognizing that all victims of the conflict possess the aforementioned rights as well as special protections in judicial proceedings.84 In short, the state is taking responsibility as a party to the violence—a far cry from the "principle of solidarity" upon which the state took on some of the burden of reparations under the JPL. In effect, the VL's definition of victimhood is not perpetrator specific: those who suffered at the hands of the state's armed forces can use the same mechanism as the victims of the AUC and the left-wing guerrillas to seek reparations. The VL is also novel in that it pays special attention to the problem of conflict-related land displacement. This is significant for several reasons. First, as mentioned above, approximately 12 percent of Colombia's population has suffered displacement. Second, land inequity and state neglect toward usurped and exploited peasant communities are among the very roots of civil strife in Colombia. In this sense, while the VL seeks restoration, it lays the groundwork for the transformative measures taken in the context of the peace negotiations with the FARC. Procedurally, the VL shifts legal presumptions regarding land ownership in favor of victims, and it establishes a well-crafted institution to oversee and adjudicate land restitution claims.